The husks separated from the nuts are retted in lagoons up to ten months. The retted husks are then beaten with wooden mallets manually to produce the golden fibre. The fibre is later spun into yarn on traditional spinning wheels called “Ratts”, ready for dyeing and weaving into myriad shades of floor coverings. A score of varieties/grades of coir yarn are produced and each variety is associated with certain specific characteristics, used for industrial, agricultural and domestic applications. 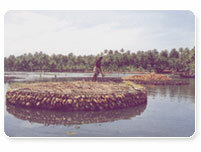 The starting point of the industry is the process of dehusking after harvesting of the mature coconut crop. 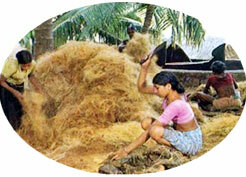 Coir fibers are extracted from the husks surrounding the coconut. In most areas coir is a by-product of copra production, and the husks are left on the fields as mulch or used as fertiliser due to high potash content. For production of light coloured fibre of spinnable quality green husk of 10 to 12 months old coconuts is ideally suitable. India and Sri Lanka are the main areas where the fibres from the husk (termed ‘coir’) are extracted by traditional methods for the commercial production of a variety of products (brushes and brooms, ropes and yarns for nets and bags and mats and padding for mattresses). However, world wide, only a small part of the fibres available are currently used for these purposes. The processes of fibre extraction are varied, and depend on the effectiveness of the wet processing such as bleaching and dyeing of coir and also varied end uses. The traditional production of fibres from the husks is a laborious and time-consuming process. After separating of the nut, the husks are processed by various retting techniques generally in ponds of brackish waters (for three to six months) or in backwaters or lagoons. This requires 10-12 months of anaerobic (bacterial) fermentation. By retting, the husks are softened and can be decorticated and the fibre is extracted by beating, which is usually done by hand. After hackling, washing and drying (in the shade) the fibres are loosened manually and cleaned. The remaining residual pith – which was previously considered a waste problem – has recently found new profitable markets as a peat moss substitute for horticultural production. Traditional practices of this kind yield the highest quality of (white) fibre for spinning and weaving. Retted fibres from green husks are the most suitable fibres for dyeing and bleaching. For the production of more coarse brown yarns shorter periods of retting may be applied. These find an increasing outlet in geo-textile applications. Alternatively, mechanical processes using either de-fibering or decorticating equipment process the husks after only five days of immersion in water tanks. Crushing the husk in a breaker opens the fibres. 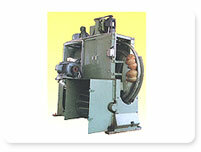 By using revolving “drums” the coarse long fibres are separated from the short woody parts and the pith. The stronger fibres are washed, cleaned, dried, hackled and combed. New environmentally friendly methods for fibre production are of interest. These can be locally exploited on relative small-scale, and have the potential to produce a more constant quality of fibres. 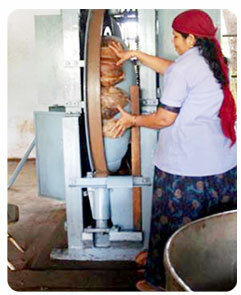 Novel developments by the Central Coir Research Institute, under Coir Board, using a bio-technological approach with specific microbial enzymes have reduced the retting time substantially to three to five days. High quality fibre production has been maintained. Similar protocols can be developed to enhance the properties of the fibres in regard to surface properties such as smoothness and porosity. By using specific (microbial) lignolytic enzymes (laccase/phenoloxidase), the fibre surface can be bleached (or activated to react more easily with the dyes).